Northborough – It might be difficult to measure work ethic and strength of character but you know them when you see them. And the football coaches who have watched Greg Crippen play and spoken with him have seen those qualities in abundance. Which is why, despite being just 16 years old, the rising sophomore has already received scholarship offers from Michigan, Purdue and Boston College. 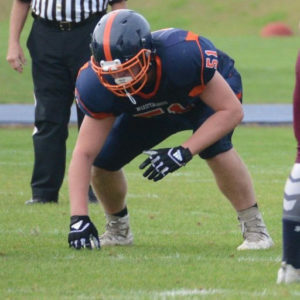 Crippen, an offensive guard and defensive tackle, started all eight games for Milton Academy’s varsity (5-3), as a freshman. At the time, he weighed 235 pounds. Over the off-season, he hit the gym, worked with trainers and packed on another 30 pounds of muscle. When Mustangs’ Head Coach Kevin Macdonald opens training camp later this summer, Crippen will stride in at an imposing 6-4, 265. Crippen’s worth ethic is no accident. His father, Tom, is a lieutenant with the Hudson Police Department. His mother, Sue, is the first female lieutenant in the history of the Framingham Fire Department. A commitment to excellence and a drive to achieve is in Greg Crippen’s DNA. Crippen began his playing career in 3rd grade in Northborough Youth Football. Starting in 6th grade, he began playing for all-star teams through MassElite Football. The teams competed in regional, and ultimately national, tournaments. His 8th grade team placed third in the country. Greg’s play and work habits caught the attention of Macdonald, who convinced him to attend Milton. 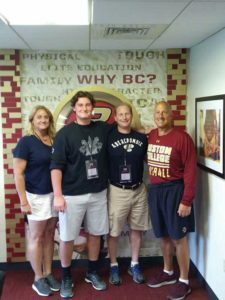 Crippen’s first brush with college recruiters came during his freshman season. But it was during off-season camps where the recruiting process began to pick up steam. While participating at a camp at UMass-Amherst, he was noticed by staff members from Michigan and invited to participate in a camp at Ann Arbor. The camp included a tour of the campus and athletics facilities. 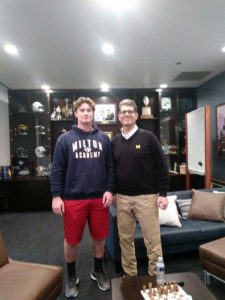 Crippen and his father were also invited to meet, personally, with Michigan Head Coach Jim Harbaugh. “He asked about (Greg’s) grades and he said ‘My guys have you as the second best lineman at the camp and you’re just a freshman and we want to offer you a scholarship,’” recalled Tom. Michigan was just the beginning. Offers from Purdue and Boston College followed. Macdonald know that this will be a busy fall. Beyond trying to help Milton win its first ISL championship since 2013, Macdonald will be helping his athletes and their families with the hectic recruitment process. As the reputation of Milton and the ISL has grown, this part of the job has gotten considerably more time consuming. “Every year we would get 100 or so recruiters over the course of the year. This (past) year we got 200,” said Macdonald. Among the schools expected to offer Crippen scholarships in the near future are Duke, Northwestern and Penn State. But there will be more. (l to r) Sue Crippen, Greg Crippen, Tom Crippen, Boston College Head Football Coach Steve Addazio.